If the label is correct, this is a rare mineral (for this locality) called langite found at the Cornwall Mine in Lebanon County, Pennsylvania, USA. 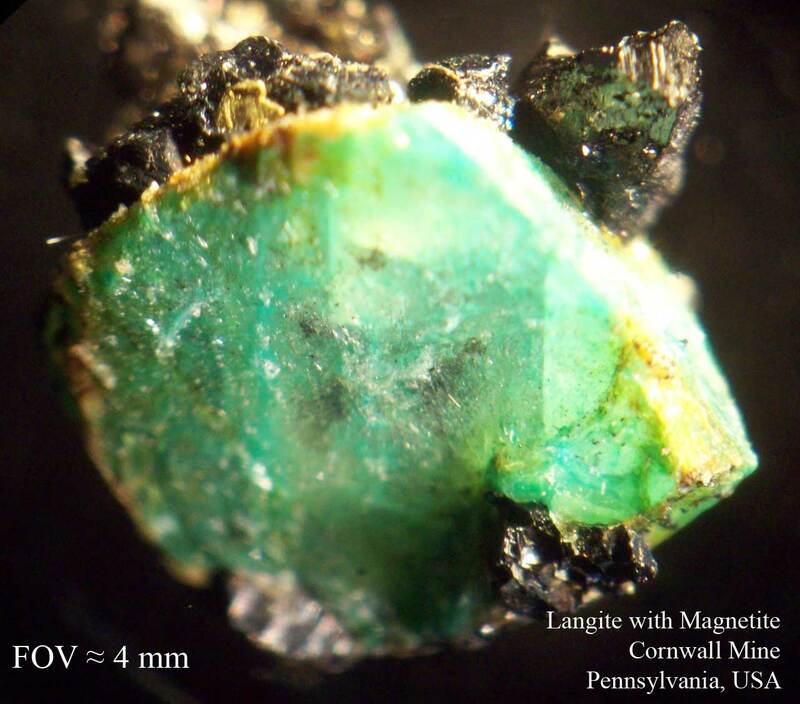 Ironically, the type locality for langite is in Cornwall, England. 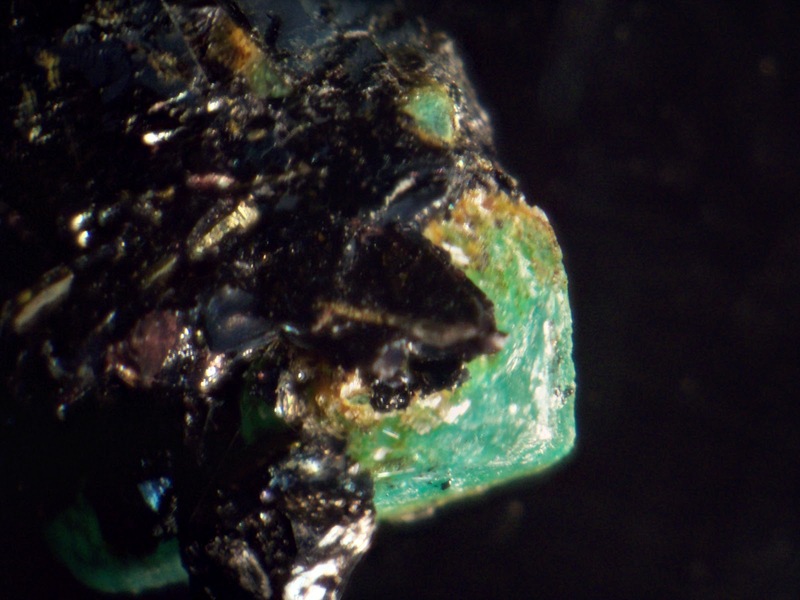 The Pennsylvania mine was named back in the 1700s by a man whose family was from that area of England.Why am somewhat skeptical of this identification is I thought langite was more blue than green in color while this one looks really green compared to other langite specimen images I see on the Internet.. This specimen appears to be composed of both magnetite and langite. Learn more about mineral on wikipedia.org. As to where the specimen came from, my friend Milt Leet was mining engineer at the mine in the 1960s till it closed in 1973. The mine was owned by Bethelham Steel and they were a major employer at Cornwall. The American economy was not great in the early 1970s and there was an oversupply of iron ore. Most of the mines ore deposits had been tapped that were economically viable and it was thought the mine would be closed by 1980. In 1973 Hurricane Agnes visited the state and brought massive rainfalls. The storm knocked out power to the pumps at the mine and as a result the shafts flooded. This event proved to be the key point to closing the mine for good. I finished reading a book called Cornwall The People and Culture of an Industrial Camelot 1890-1980 by Carl Oblinger. The book is an eye opening set of remembrances of a time in American long past. The stories related are of an American time period when corporations were more paternalistic and the standard of living in the United States was quite low. Watching the news one can hear about how the economy is bad in the United States right now but if you read this book about how things were in the 1920s and 1930s in a this Pennsylvania mining area, we are in great shape. No running water or electricity, limited transportation, food selection limited to the growing seasons and what could be preserved during the winter are just some of the factors the population had to contend with less than 100 years ago. The book also sheds light on the blending of different nationalities as the immigrated to the country to work in the mining sector.